Shanghai is an awesome place to have a long layover. On my way to and from Bali, I had about 13 hours on the ground both ways. So, I left the airport and made my way into the city. China is part of this amazing program called 72-Hour Visa-Free Transit (info here & here). It basically allows people who are laying over in China to venture outside the airport and spend their tourism dollars, all without the hassle and expense of getting a visa. You technically have up to 144 hours on this program, so you could even plan your trip with a few-day stop in Shanghai. From there, I bought a ticket into the city on the Maglev high speed rail. Pudong is on the outskirts of town, so the rail gets you into the heart of it very quickly and inexpensively. 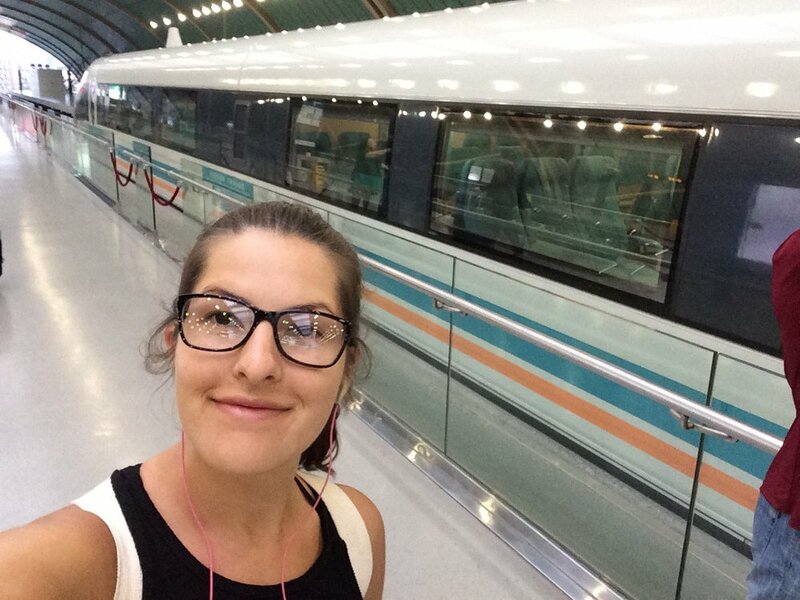 REALLY good photo of me next to the Maglev. This is what I get for not brining my selfie stick. The Maglev lets off at a station that, again, isn't quite to the heart of the city. So I transferred over to the metro. English is everywhere here as well, so it's really easy to use. I made my way to People's Square, where I walked around in the early morning. I didn't see any other tourists, but I felt very safe. Which is important to note, since this was my first solo trip as a female traveler. The Urban Planning Exhibition in People's Square, Shanghai. The Shanghai Museum, also located in the People's Square. Everywhere in downtown Shanghai is perfectly manicured. From there, I started making my way toward Nanjing Road, which is a strip of commercialized stores and shops. Pit stop for a little dumpling on Nanjing Road. Walking down Nanjing Road in Shanghai, China. Having done some exploring, I was ready to taste the local cuisine. I'd found a place called Grandmother Shanghai Restaurant via my Lonely Planet guide, so I headed that direction. 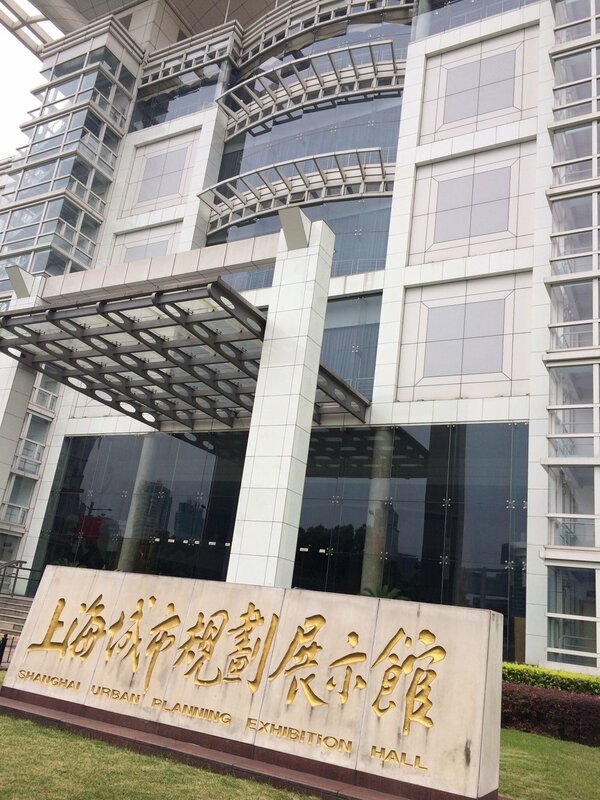 The staff was not super friendly to me here, but I came to find out that was general Chinese hospitality, at least to tourists. I ordered myself three plates of food for probably $15 USD, which was more than enough for two people. As you can imagine, the food was insanely good. I regret to inform that I did not take a photo. After food, I walked to The Bund, the beautiful waterfront parkway. There, I was stopped for my first selfie with a Chinese man! Always nice to make someone's day, but you gotta wonder where those photos end up. Anyway. The bustle of the Bund against a backdrop of Shanghai's financial district. My favorite photo from the trip of Shanghai's Financial District. It was time to make my way back to the airport. I definitely gave myself more time than necessary to get back, since I wasn't sure how long it would take me to go through customs and security again. I got through both in under an hour, so had a good amount of time to charge my phone and get a snack before the flight. Off to Bali I went! 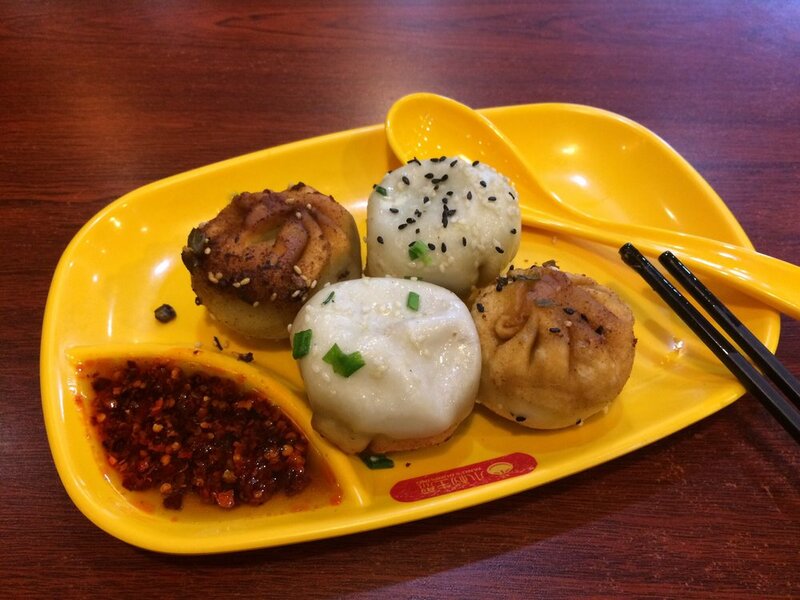 The breakfast of champions is dumplings. I got a plate of six at the renowned Yang's Fry Dumplings, also recommended by Lonely Planet. What they don't tell you is that no one speaks English, and it's a very quick-moving place. The cashier gives you a ticket, which you are then supposed to bring to the dumpling window, where they will give you your dumplings. I naively took my receipt and sat at a table until finally getting up to ask the cashier where I was supposed to get my dang dumplings. Very uncomfortable, but so worth it for these crispy chewy juicy bad boys. Yang's [incredible] Fry Dumplings. Get a ticket at the cash register & give it to the fry guy through the little window. I spent the better part of my morning at the Shanghai Museum, resting my feet and exploring the galleries a bit. This was just about the only place in the city I found other tourists. It's a really beautiful and modern museum. Walking through one of the many beautiful parks in Shanghai. At this point, I had already spent the last ten days on my feet backpacking around Bali, so all I really wanted to do was relax. So, after the museum, I headed to another Lonely Planet food local called Spicy Joint. It was a Sichuan place, so everything on the 100-page menu had a very rich, distinct flavor. I ordered five things for about $11 USD, and probably finished a quarter. I had no idea I was ordering so much food! I felt so bad about tossing it that I had them pack it up for me, and I carried it around the rest of the day and ate it for dinner. Stay sustainable, friends. I love how this photo juxtaposes the chaos of street traffic with the elegant buildings shrouded in fog. My feast for one at Spicy Joint. Absolutely unbelievable Sichuan for very little money. 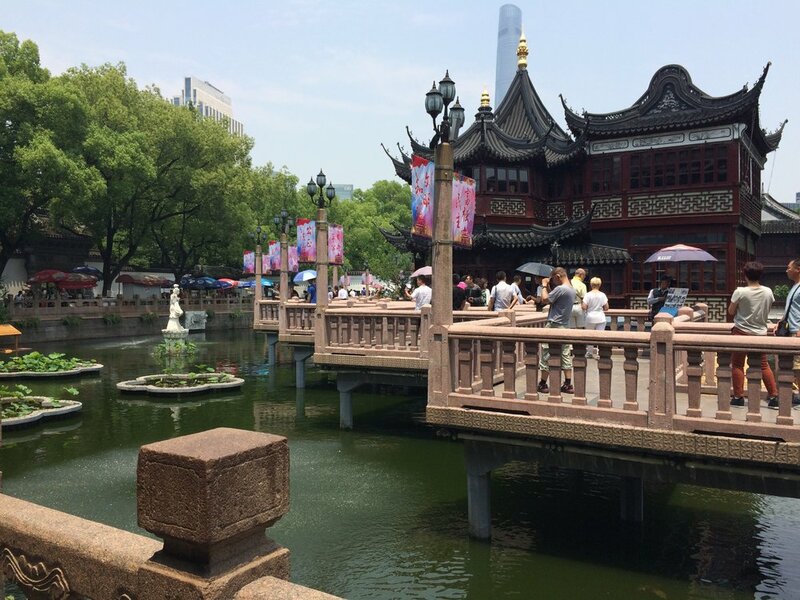 To end my second day in Shanghai, I walked through the older, more traditional part of town to get to the Yu Garden. Walking through Old Town in Shanghai, China. As I bought my ticket and walked into the garden, fat warm heavy raindrops started to all from the sky. It was nearing dusk, but dark grey clouds rolled in so quickly that it felt like night had fallen. Then, it began to pour. Fortunately, I'd bought an umbrella earlier in the day for some light showers, which I used to hop from room to room in the garden. Eventually, it started to thunder and lightening, which lasted for about an hour. At one point, I just sat in awe of the beauty around me and the absurdity of a storm hitting in that moment. I was a little scared, because I was on my own and needed to get back to the airport soon and get on a flight home. But sitting in a beautiful, ancient pagoda while rain pounds down all around you is a pretty cool experience, so I tried hard to just be in the moment. You can kind of see the rain drops falling in the koi pond. Doesn't even compare to the lighting & thunderstorm that came next. I really wish I had more time in the gardens. I also never made it to the Shanghai Tower or Oriental Tower for some city views, which many people recommended. That, along with a river boat tour, are the first thing I would do given the chance to go back. I really hope I have another layover in Shanghai. I was really nervous about taking advantage of this 72-Hour Visa Free Transit program, but it was SO simple and painless. I would recommend anyone with a long layover to take advantage of it. For more travel stories and adventures that help uncover your next incredible adventure, subscribe to the blog and I'll make sure to keep you updated on everything you might miss!